Cover image: Dee Dee King (Derrick) Union Square. 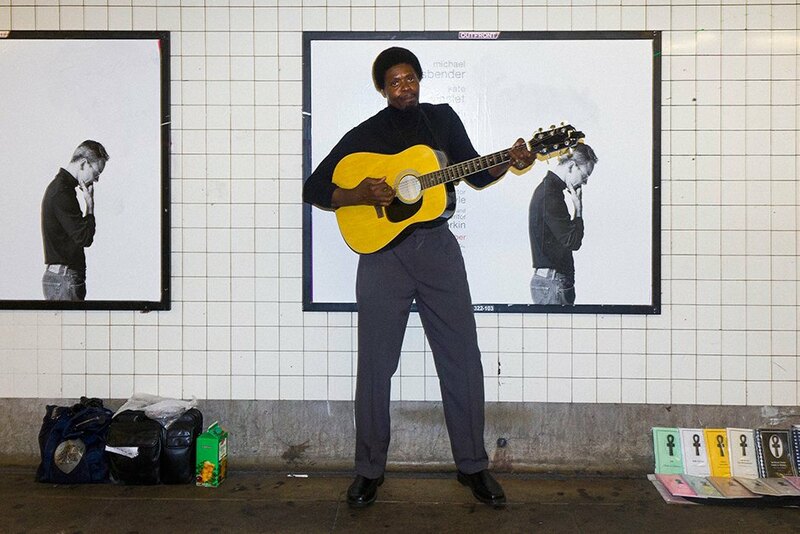 King's been performing in the subways for approximately four months—three days a week, six hours a day. On a bad day he makes about $30 and up to $80 on a good day, he tells Hopes&Fears. For all but a few, New York City’s subway system is not a final destination. Commuters navigate its subterranean corridors so that they can be somewhere, really anywhere, else. 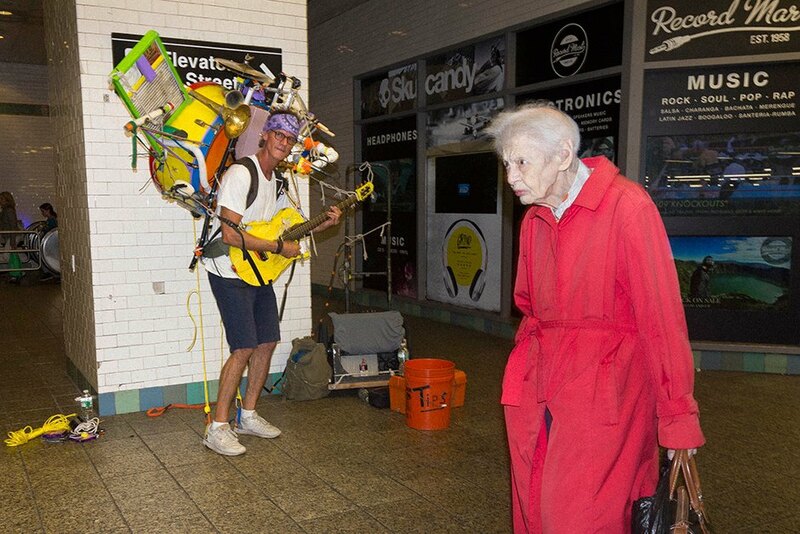 However, buskers are an indelible fixture of the New York City soundscape and have been since 1985 when a fifty-year ban on subway performances was lifted. Now, artists spring up at seemingly every station and countless people are able to make their living plucking away underground. Hopes&Fears asked me to travel this lightless space to learn how buskers are faring, both economically and creatively, in this era of earbuds, podcasts, and Spotify. What he means by “hustling” has no hint of the pejorative. It’s more related to perseverance. 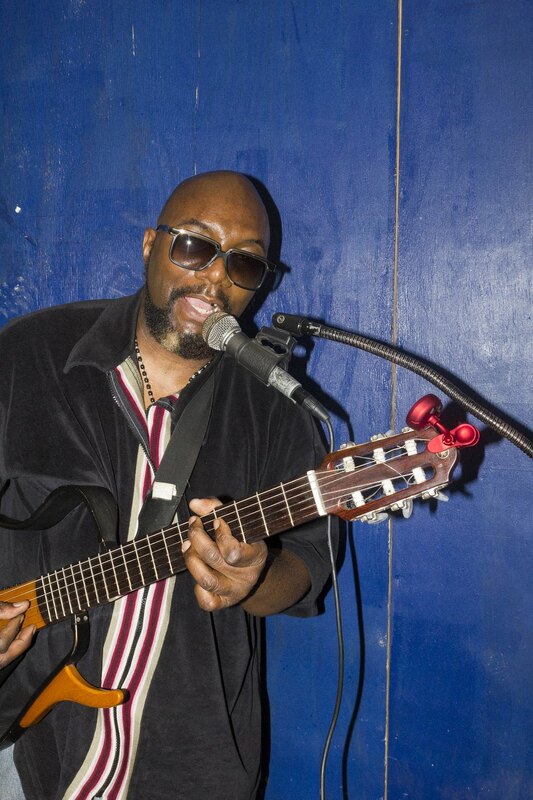 Nearly everyone I interviewed—all of whom I discovered by chance, either in person and also online at The Busking Project (a virtual community for buskers and fans)—approached their performances with a similar degree of seriousness and dedication. Treating busking as a profession, or at least as a serious component of one’s career can actually make for a sustainable life. The majority of people I encountered are full-time musicians, and of those, all of them earn the bulk of their income as itinerant players. Segbefia sees similar numbers when playing between 7:00 am and 10:00 am and then again from 4:00 pm to 7:00 pm. The same is true for Ruiz, who estimates he earns between $100 and $200 on average when playing at Union Square, Herald Square, or near the A train at Port Authority. Jason Cordero, an eighteen year old pianist who regularly plays an electric keyboard at Times Square and the same high-traffic stations frequented by Ruiz, makes about $180 during the three hour time slots in which he performs three times a week. “I’d rather play for three hours and make that much than work in a different place and make $10 an hour,” he says. Song choice or style of music may matter (the Prelude from Bach’s Cello Suite No. 1 can often be heard from violins and cellos alike—sometimes even at the same station), but neither seems to have a definitive influence on how many dollars are dropped into an instrument case. Segbefia knows that, for him, donations often increase when he plays Schubert’s Ave Maria, but the same is true for “What a Wonderful World.” But classic hits aren’t the only answer; after all, Joseph pays his rent with his own ambient compositions. Less than twenty years ago, a pocket wasn’t a storage unit for an entire music collection and cell phones didn’t need to be surgically removed from many of our hands. And yet somehow even now our intensified solipsism doesn’t distract us from paying attention to other humans paying attention to something. The brass band Lucky Chops make themselves known to everyone at a station with their wall of sound and boisterous stage presence, both of which feel better suited at Terminal 5 than a dark and dingy corner below Grand Central Station. Each time over the last few years that I have seen them playing, a crowd of at least thirty gathers around them and remains for the length of an entire song. This popularity has earned them more than a few dollar bills, however, as they just began a new gig as the house band for MTV’s Girl Code Live. Life for a busker is not, however, dependent on crowds or a chain of giving, and in many respects, this isn’t even what they hope to gain. Dennis Ho, a bass guitar player, shares her belief. 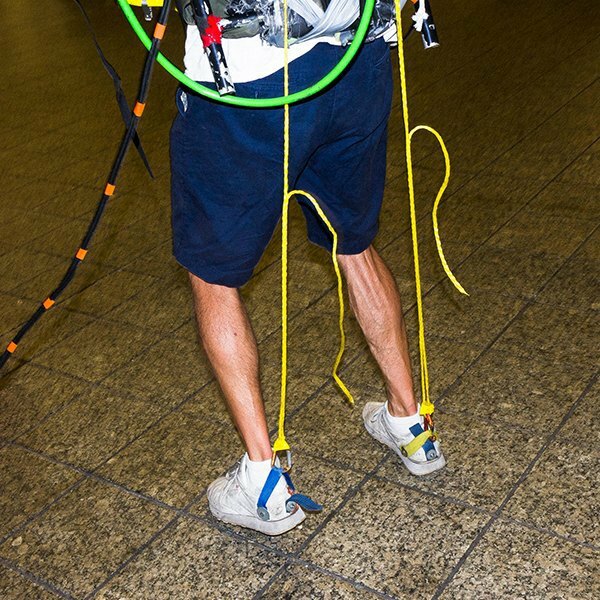 About ten years ago, Ho, a photojournalist and waiter, used to be “the Q train guy”—a route that would make him about $10 to $12 an hour. Now with a young daughter and a more strenuous day job, he no longer has time to busk professionally, but each night when he leaves work, he either goes to the basketball courts or the subway. 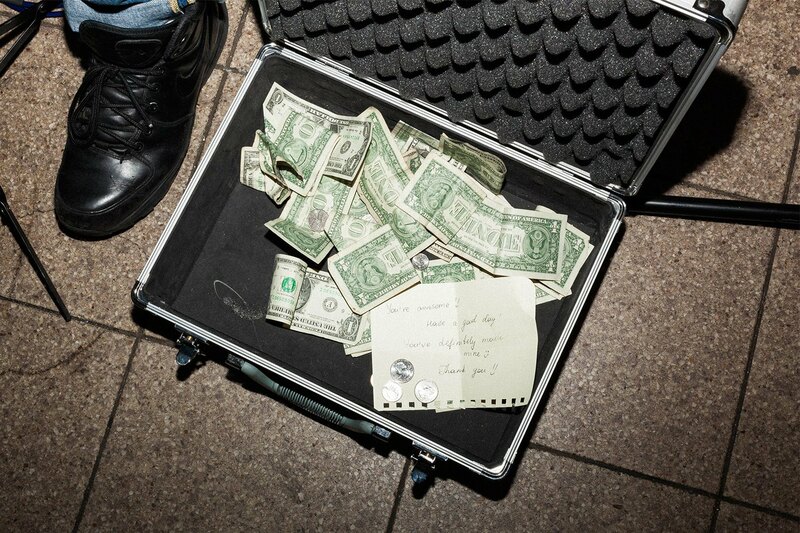 “A huge element of busking is giving,” he told me over the phone. “If you really make a connection with somebody, and they’re giving you the energy back, it will spark like fire.” Though he appreciates the dollar he earns from a person who, as a rule, gives money to every performer, he puts a higher value on the more ephemeral payoff. 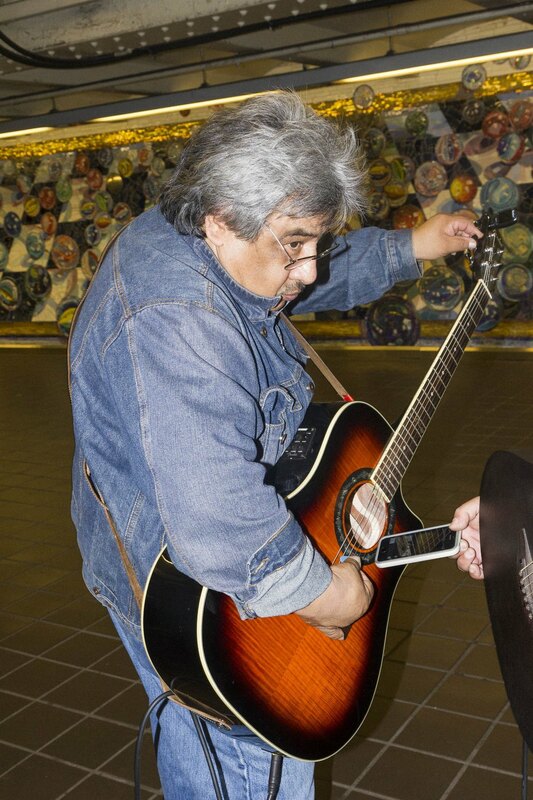 “I love to play for people who appreciate and are listening—homeless people or whomever—because it’s a form of love.” This explains why you can often find him at Grand Central in the narrow corridor leading down to the 7 train. The space restrictions do not allow virtually anyone, let alone a large group, to stop and listen, but the acoustics are vastly superior to the platform at the end of the path.